It’s been a while since my Cruachan smock arrived and I wanted to write and tell you about my experience with it so far. The Cruachan smock arrived in a week when the weather was turning cold, and for several days it was consistently well below freezing here in the East of the Netherlands. This was great news for someone with a new Ventile smock that needed trying out! With such low temperatures it was not wet at all, but the ponds, canals and small lakes nearby froze, and a couple of outdoor ice rinks were open. I can tell you that the Cruachan smock is warm! Fairly leisurely skating with just a shirt and the smock on, in temperatures of around -5°C was certainly warm enough. It is also windproof, so it didn’t make a lot of difference whether I was skating into the wind or not. Being breathable, there was no build up of condensation, but there are side zips and a generous zip at the neck that help keep air circulating if need be (they also help a lot with putting it on and taking it off). This is all good news if you don’t want to carry lots of extra clothing with you. For hill walking in Scotland I would take an extra layer or so for stops, but while exerting oneself, this will be warm enough with just a shirt in all but the coldest weather. The smock is very well thought out. The smock is very well thought out. In addition to the handy side zips there are numerous pockets – two upper chest pockets each big enough for a compact camera or a large smart phone, wallet etc. There is a pouch mid chest that easily accommodates a folded OS map and compass, and then a very generous lower pocket that is accessed through zips on each side, so you could also use that as a hand warmer pocket (I find my self putting gloves in there when I don’t need them. There are drawstrings at the waist and the bottom hem, to adjust fit and how you wear it. 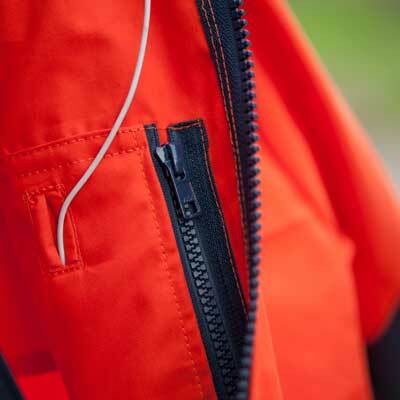 There are also drawstrings in the hood, one around the face along with a wire rim stiffener that useful in blizzard or driving rain, and another on the back of the hood to adjust the overall length in relation to your neck and head. The zip at the front can be done up to chin height and has an extra tab on the inside so that your chin is not grated by the zip. There is also a velcro baffle to go over the outside to be sure that wind is kept out. Cuffs also have velcro tabs to tighten them up as much as you like. While the smock is described as double Ventile, the amount of extra reinforcement on the lower arms and shoulders as well as all of the pockets mean that over much of it, you have more than two layers. Getting wet will not be a problem – I have been using Ventile coats for over 20 years now, so I have every confidence in its ability to keep the water out. This is obviously not a light garment, and there will be times in the summer when wearing it for walking would be simply too hot. However, for less active pursuits it will still find plenty of uses in the summer, and as a winter outer layer, you could take this anywhere with full confidence that it will keep you warm and dry. Near Kilchurn Castle with Monadh Driseig and the shoulder coming down from Stob Daimh (at the east end of the Cruachan horseshoe) behind me, and Being Eunaich on the right of the picture.